If form is an accurate indicator of who will win a football match, then there should only be one outcome as Dundee United travel south to face Dunfermline at East End Park. The Tangerines have lost their last two matches while the Pars have put together a five-game winning streak that has propelled them up the Championship table. The Fife side have also kept clean sheets in all of the matches while on-loan Aberdeen striker Bruce Anderson has scored three times in as many games including the winner last week at Alloa. However, United’s Peter Pawlett insists his team can tear up the form book and secure three points to keep their title hopes alive. The former Aberdeen and MK Dons winger said: “Dunfermline’s form speaks for itself. They’ve had five wins in a row so it will be a tough game for us. “We know that but we have to be confident enough to go there and believe we’re going to get the three points. “I think we have to respect them and we all certainly do. “We know what quality they have. I know Bruce Anderson from Aberdeen and he has been doing really well for them. “Bruce was a great young lad at Aberdeen and is a good goal-scorer. “I’m sure he’ll have a really successful career. “They haven’t conceded in five games so we want to change that and score goals. “But the most important thing is winning the game – simple as that. United certainly need a win to keep alive their slim hopes of catching title pace setters Ross County and Pawlett insists the players should thrive not buckle under the stress of trying to do just that. The 28-year-old said: “The pressure is what you thrive on as a footballer. That’s what you want when it all boils down to it. “If you don’t have that, your life becomes a bit lacking. So you want those kind of games where things depend on it. “That’s how you drive yourself on as an individual and your team-mates also. “Personally, there have been a few games I’ve played in my career where there’s been pressure and I’ve enjoyed it. Pawlett missed last Saturday’s league defeat at Partick Thistle through suspension and he is doubly determined to help United recover quickly from that setback. He said: “We’re absolutely looking to bounce back. “It was so disappointing last weekend losing at Partick Thistle, and the weekend before that going out of the cup to Inverness. “Those were two poor results but we have the drive and energy to put it right. “We’ve just got to roll the sleeves up and go again. The aim is to try to win all our remaining games. “That’s the belief we’ve got to have. We’re treating it as though we have nine cup finals, starting with Dunfermline. “Ross County are a good bit ahead of us so we know the challenge if we are to go up automatically. 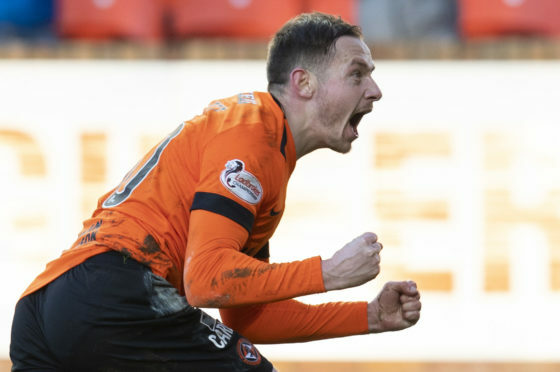 Pawlett added: “You can get caught up too much in your head about this game and that game. “For us, we need to concentrate on ourselves. “Hopefully things start turning our way. You need to have that positive mindset. While desperate to take all three points at Dunfermline, Pawlett acknowledged United cannot afford to throw caution to the wind. He said: “All of us have to be full of energy and express ourselves. “But there’s also the other side of the game where we have to be aware of the threat they have, so we can’t be gung-ho. “We’ve got to be a bit tactical and get the balance right. If we can do that, then we’ll have a good chance of getting results. “We’ve got some experienced players – myself included – who maybe need to just do their bit with little pieces of advice on the field, like come back here and don’t go too far up.